Featuring a pretty epic crossover with Season 2's Asylum, the season finale of American Horror Story: Roanoke will air on Nov. 16. That means you must already be wondering what's going on in the wacky and wonderful brain of creator Ryan Murphy for the theme of American Horror Story Season 7. Thankfully, the TV mastermind already said that Season 7's theme will be announced before the next season airs. That's a relief after the mysterious theme of Season 6, which wasn't revealed until Roanoke premiered. Still, fans will have to wait to know what Season 7 will be about since, based on Murphy's comments over the last few months, FX will be keeping it secret until spring 2017. So what do we know so far about AHS Season 7? And what can we wildly speculate about based on that? Murphy explained the typical schedule for AHS — and why he had chosen to switch it up for Season 6 — to The Hollywood Reporter in August. "John Landgraf [of FX] and Dana Walden [of Fox TV Group] and I were talking, and the show is in its sixth season, and we've always done everything by the book. Come January or February I announce what the theme is, and then we announce the cast. We wanted to [create a] different experience for the fans this year," Murphy said. Luckily, Murphy said on a conference call in October that Season 7 will go with the more traditional route when it comes to its theme reveal, TVLine reported. Except he also said Season 7's theme won't be revealed until the spring, which means you'll have to wait a few more months than usual. Still, fans can put those extra couple of months to good use since Murphy has been revealing some juicy tidbits about future seasons. Based on the information Murphy has been providing, here are some clues and conjectures about AHS Season 7. In that August interview with The Hollywood Reporter — before Season 7 was even officially renewed — Murphy was asked if future seasons would start connecting to one another more prominently. Murphy responded, "You'll see it this season, and then you'll really see it after this season. We lay a lot of pipe, and you'll see it explode in Seasons 7 and 8." That means that something as satisfying as Lana Winters showing up in Roanoke will become the norm, not the exception. Murphy also told THR that he wants AHS to have its own "inner" mythology like The Twilight Zone and that there's no end in sight. "I'll keep doing it for as long as we have the ideas and the momentum," Murphy said. How's that for good news? 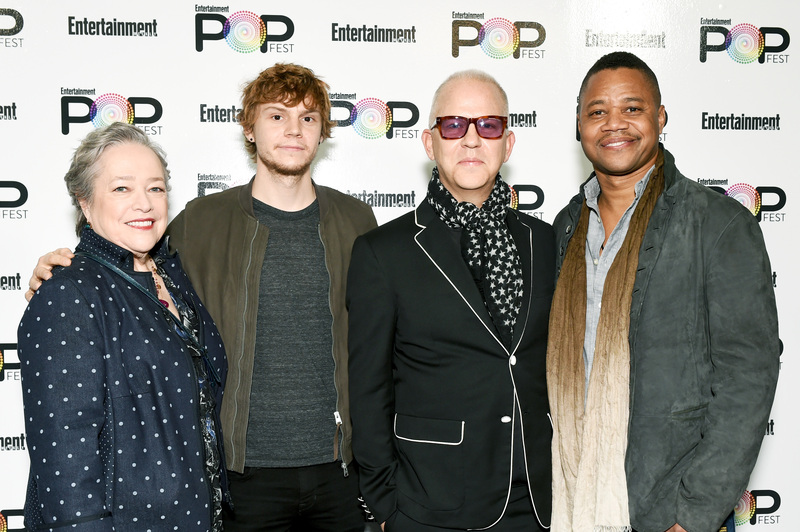 At Entertainment Weekly's PopFest in October, Murphy teased the most amazing AHS connection of all — promising a Murder House and Coven crossover with characters from both Season 1 and Season 3. "It's not going to be next season, but we are going to do a season that's a crossover between Murder House and Coven together, which is very bizarre," Murphy said. He said it can't be next year since it takes too long to plan with all of the actors' schedules, but that's something to look forward to nonetheless — even if it doesn't offer any explanation of what will go down in Season 7. Also good to know? In that October conference call, TVLine reported that Murphy said Lady Gaga's witch of the wood from Roanoke is the original Supreme, so maybe that character will come back into play for that crossover season. Although, come to think of it, it wouldn't be Gaga portraying her since Gaga was actually the My Roanoke Nightmare reenactment actor portraying the witch. Moving on . . .
Back to what might actually happen in Season 7. Yet again, in TVLine's write-up about the October conference call, Murphy said that Freak Show characters will show up in Season 7. He did promise the connections would "explode" in Season 7, so bring on the Season 4 characters! As in, please bring back Jessica Lange. Please. Freak Show took place in the 1950s, so if those characters are involved, then it seems relatively safe to assume the season will occur in the past. Reddit user funky-al took that Freak Show clue, plus military references in Roanoke, to guess that AHS Season 7 might have a "WWII era military and government conspiracy theme." To go along with that, people thought that Season 6 might be about aliens and Area 51, but perhaps that's what Season 7 will cover. One redditor (his or her username has been deleted) brought up how each AHS season seems to alternate between worlds that are more urban, glamorous, and human-based (Murder House, Coven, Hotel) and worlds that are more rural, gritty, and supernatural (Asylum, Freak Show, Roanoke). Based on this pattern theory, he or she wrote, "I think S6 is gonna be dark, gritty, rural and supernatural, therefore I would like S7 to be more camp, city centred, light and human based....and I think a CASINO would be perfect for that, a LAS VEGAS CASINO to be precise." The idea of a Las Vegas casino theme is backed up not only by Freak Show's Massimo (played by Danny Huston) referencing nuclear bomb testing in Nevada (something funky-al noted), but also because of next season's number. Reddit user Wartortuga wrote, "[Massimo's reference], coupled with the fact that next season is lucky number 7 has me thinking we might see something taking place in Las Vegas?" I'm definitely game for a Vegas-based AHS. In another interview with EW, Murphy talked about a secret AHS season that no one really knows anything about. "I've been working with a writer on a season that only he and I know. It's like a two-year project that we'll continue to work on the sly and not tell anybody," he said. But based on the details that Murphy has already revealed, Bustle's own Amy Mackelden doesn't think Season 7 will be Murphy's covert season and neither do I. It Will Be "Narratively Strange"
Fans don't need to be told that an AHS season will be strange, but Murphy offered one more additional insight to EW about the structure of Season 7. Like Roanoke, with its show-within-a-show format and big twist halfway through, he said, "[Season 7 is] also a narratively strange idea." Not like AHS seasons are known for being linear, but it's just another hint that can be thrown on the theory fire. Even before the Season 6 finale of American Horror Story airs, Murphy has provided fans some intel to keep them going through the AHS drought in the upcoming months. While we're still far from knowing what the season will actually be about, at least we're better off than we were for Season 6.